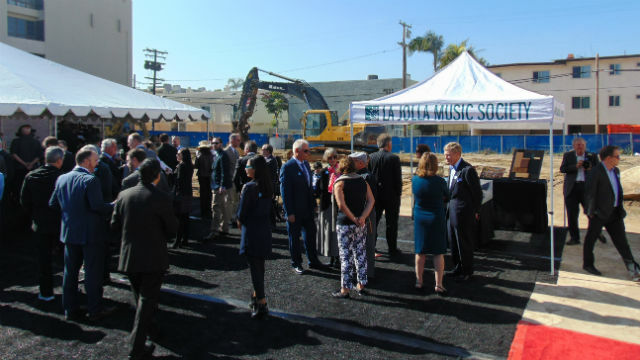 With a cellist performing Bach in front of a backhoe, construction officially began Wednesday on a $76 million new home for the La Jolla Music Society. The Conrad Prebys Performing Arts Center will feature a 500-seat concert hall and 140-seat flexible performance space. The building by Cambridge, MA-based Epstein Joslin Architects is intended to be both architecturally significant and acoustically exceptional. 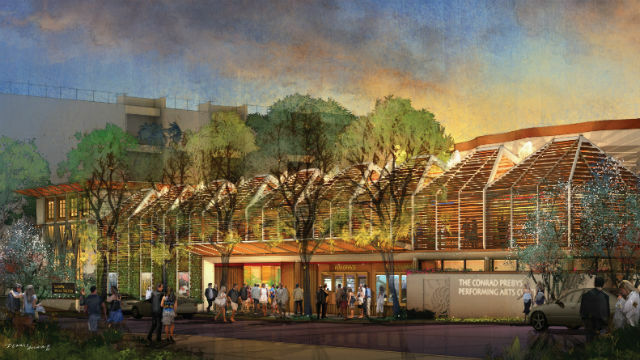 “In addition to being a beautiful arts center for world-class performers, the Conrad will also be a community resource available to all San Diegans to book for performance, community and private events,” said Kristin Lancino, president and artistic director of the music society. Mayor Kevin Faulconer said the new performing arts center will be a “powerful addition” to the city’s cultural scene. “Not only will this new venue dramatically expand artistic opportunities for our city and the region through added programming and educational opportunities, it will bolster our national reputation as a world-class performing arts and cultural destination,” he said. The 49,000-square-foot building is expected to open on Fay Avenue in downtown La Jolla on Jan. 20, 2019. Most music society events are now held at Sherwood Auditorium, but that is closing after March for renovation of the Museum of Contemporary Art, so the society is planning for nearly two years of temporary venues. The new center is named for Conrad Prebys, a noted San Diego philanthropist and supporter of the arts who died last July. His life partner Debbie Turner said that while Prebys donated to many causes and projects, the music society was always special. Donors have privately raised $62 million for the building. With construction underway, the music society has begun a public fundraising effort to secure the remaining $14 million. A rendering of The Conrad’s entrance on Fay Avenue.